The Crusaders have now beaten the Hurricanes twice already this season after their 38-22 win in Christchurch five weeks ago. If there were any emerging doubts about the red and black dominance, Robertson’s men have also won their last 11 New Zealand derbies. Many expected the vaunted might of the Crusaders forwards to prove the difference. It was instead the Hurricanes backline and a string of consistent errors that let them down. 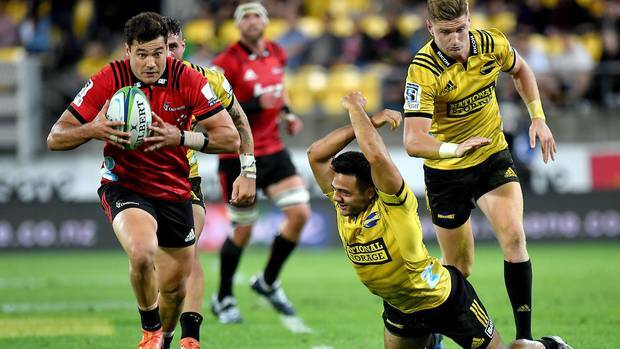 In Wellington tonight they ended the Hurricanes’ 13 game unbeaten home run with ease. The clinical, ruthless manner of this performance once again shone a light on the gulf between these teams who, prior to this match, were locked at the top of the Kiwi conference. For the most part the Hurricanes pack stood up to the visitors. Their scrum more than held its own, and while they made far too many mistakes in the tight, they generally gave as good as they got in competing and challenging the breakdown. While their big men stood up at the set piece, the Hurricanes back three were twice exposed early and they never really recovered. First Bryn Hall and Will Jordan combined to catch Ben Lam and Chase Tiatia napping. David Havili then made the most of Tiatia dropping a high ball to make it two tries from kicks in behind.